The first of our poetic delights is Milan Kundera’s Life is Elsewhere, a detached, sardonic description of Jaromil (the poet), a young man growing up in pre- and post-war Czechoslovakia. From an early age, Jaromil has been encouraged – mainly by his mother – to believe that he is special and talented, and this talent manifests itself in the form of poetry. We follow the young poet through his formative years and see his efforts to make sense of the world and his desire to achieve love (or, at least, lust). Sadly, Jaromil, while possibly gifted with poetry, is a much less perfect human being in most other respects, and as the story progresses, the reader becomes ever more tired of his immaturity and stupidity. Don’t worry; that’s exactly as Kundera means it. One of the most striking aspects of this book is the relationship between Jaromil and his mother, who smothers him from a desperate sense of belonging and a desire to live life vicariously through her precious son. I was reminded a little of Paul Morel and his mother (from D.H. Lawrence’s novel Sons and Lovers) in the way Jaromil attempts to free himself from the apron strings (although Morel was a lot more successful at it…). Over in Dublin, meanwhile, James Joyce paints his alter-ego Stephen Dedalus (one of the main protagonists of the ever-so-slightly complicated Ulysses) in a slightly more sympathetic light (although the theorists in the introduction to my version would disagree, obsessed as they are with the ‘ironic’ treatment). A Portrait of the Artist as a Young Man is a surprisingly readable plotless novel, through which the reader follows Dedalus through his childhood and youth until he embarks on his quest to become an artist. From his early, relatively comfortable days, we accompany Stephen on selected, important events in his life, defining moments which help to shape his character – and, perhaps his soul. Despite his eventual rejection of church teachings, his language and demeanour remain immersed in his pious upbringing (one of the ironies mentioned earlier). After overcoming his teenage angst and sinning, he briefly considers becoming a priest himself, but a chance encounter on the beach, one of several moments of poetic beauty, strengthens his conviction of the inevitability of his ‘fall’ back into real life. Dedalus, on the other hand, is portrayed mostly from inside. We see things as he sees them, especially in his younger days. Admittedly, the older he gets, the more we see Stephen (as opposed to seeing through Stephen’s eyes), but he is never objectified to the extent that Jaromil is. In contrast to the young Czech poet, Stephen has doubts, both about his gift and (more importantly) his soul. The chapter in which he wrestles with the concept of hell and his possible fall shows a beauty of description which Jaromil would be unable to comprehend. Perhaps the biggest difference though is Dedalus’ rejection of the institutions which claim to lead us in the right direction but which, in fact, may tie us down. Stephen rejects both the Catholic Church and the Irish nationalist movement, seeing both as nets which are there to prevent him fulfilling his potential and ambitions. However, he does not impose his beliefs on others, content instead to stand aside and create his own beliefs in preparation for the departure into a new life. Though I have praised Stephen and cursed Jaromil in the lines above, please do not fall into the trap of confusing my opinions of the characters with my opinions of the books. Both of these novels are wonderful to read, but in very different ways. Kundera’s light (unberably light? ), ironic style contasts with the brooding intensity and introspection of Joyce’s lightly-veiled self-portrait; however, the end result is equally as pleasing. 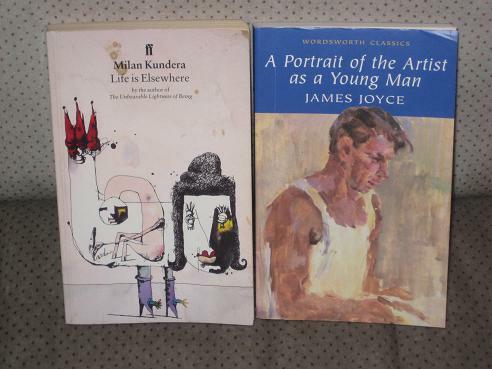 Joyce’s book is just a portrait of a young poet; Kundera’s is equally valid – and entertaining.